Papergreat: "Steal not this book my honest lad"
The pencil inscription on this 1932 edition of the history textbook "Our Republic" reads: "Steal not this book my honest lad for 50¢ cost my dad and you will say at judment [sic] day where is that book you stole away." It's a unique variation on an old, familiar theme. I could not, though, find any other online references for phrases that specifically begin with "steal not this book my honest lad." Maybe this book owner was going for his or her own original rhyme. According to Littera Scripta: "It was traditional, particularly before the invention of the printing press when books were all hand written manuscripts, to letter a curse into the book to prevent theft. Unfortunately, it doesn't seem to have worked very well, as the books also had to be chained into place." One of the most commonly used modern inscriptions starts with "Steal not this book for fear of shame, for in it is the owner's name." 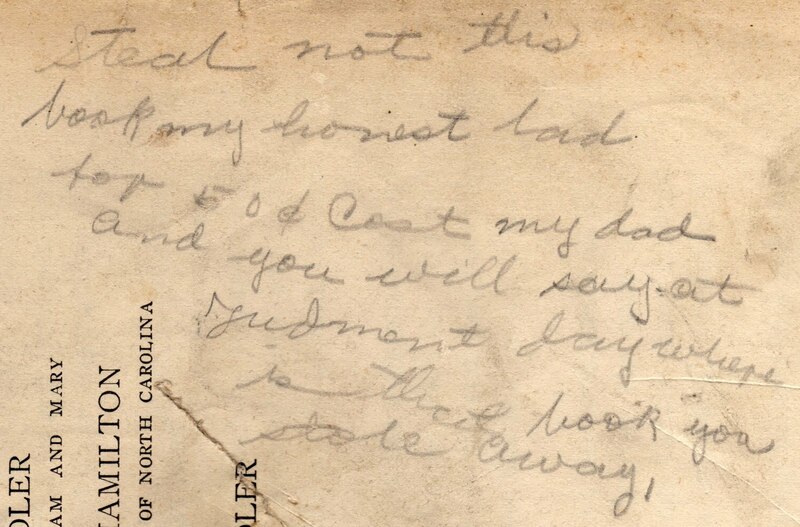 From Littera Scripta: "Steal not this book, my worthy friend For fear the gallows will be your end"
From the Virginia Commonwealth University Libraries' preservation department: "May the sword of anathema slay If anyone steals this book away." From Old-Time Schools and School-Books: "Steal not this book, for if you do, Tom Harris will be after you." 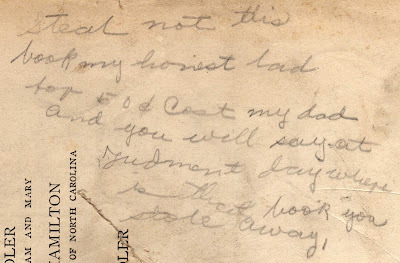 From Old-Time Schools and School-Books: "Steal not this book for fear of strife For the owner carries a big jackknife." From Littera Scripta: "He who steals this book may he die the death may he be frizzled in a pan..."
Frizzled in a pan. That sounds uncomfortable. I have a primer with a similar inscription: "Don't steel this book for fear your life/for the owner carrys a big jacknife." 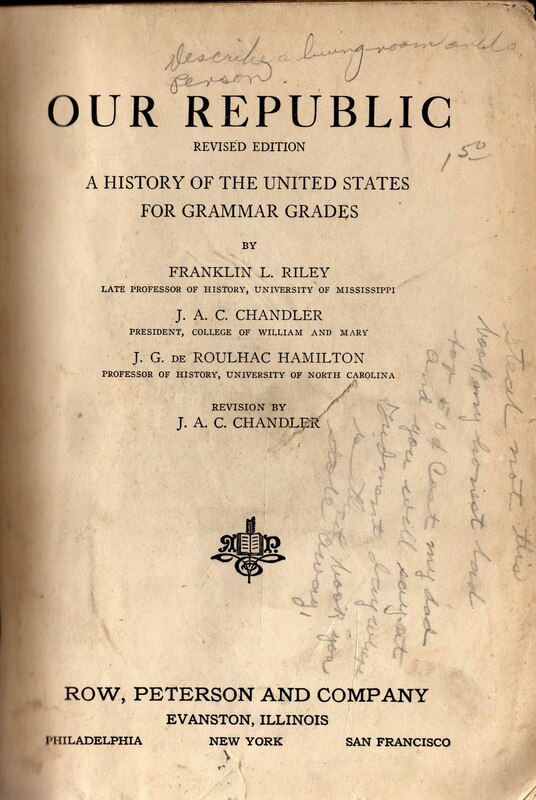 Judging from other graffiti in the primer, this book seems to have come from my home state of Alabama, around 1880 (the book itself was published in 1850; I've always assumed a dearth of schoolbooks after the Civil War). The primer belonged to a girl named Beth Young, who left another small verse on the title page: "If you wish my name to see/Look on page 103"--where she left a lovely and elaborate signature. 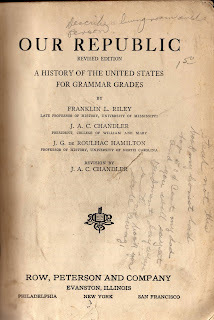 do you know where i could access online files of old textbooks?